We caught up with Susan Witte, our award-winning Paralegal Studies student. Needless to say, she's been quite busy with finals and wrapping up her classes at Peirce. But we are so happy to hear that she had a wonderful time at the National Federation of Paralegal Associations (NFPA) "Celebrate Success" awards luncheon. Susan spent a few days in Portland, Ore. to attend the event, where she accepted the 2009 NFPA/Thomson Reuters Scholarship. 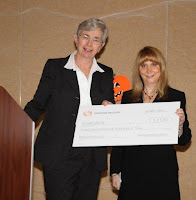 Here is Susan (right) accepting her scholarship from a Thomson Reuters representative. Susan was able to share her thoughts on the experience and her future plans with Peirce Connections. Read on below for her update. Thanks again, Susan! Peirce Connections: How do you feel about receiving the NFPA/Thomson Reuters Scholarship? Susan: I was so excited for the scholarship and so nervous to receive it. To me, this was the biggest award I've ever received! It went by too fast, but it was really wonderful, and the whole experience was a great once-in-a-lifetime thing that I'll never forget winning. I feel very honored to win an award based on something that I feel so strongly about, and I hope to somehow contribute to the ideals of equal access to justice at each stage in my career. PC: With classes done and your certificate completed, what's up next? S: I love this college, and I'm really sad to go. I'm looking forward to getting involved in alumni events, coming back, and giving back. And of course using my new degree! I always wanted to go into a field where I could help make a difference in some way. So far I've done part-time and pro-bono work with the SeniorLAW Center, Philadelphia VIP, and the Court of Common Pleas in Philadelphia. I personally feel that no matter what you do within the legal profession, you can usually find a way to play a part in maintaining equal access to justice. It might be pro-bono, or it might not. But I would love to do anything that could be helping people where they were a victim of something that wasn't their own fault. In a perfect world, I'd love to work in a place where I could help people all day, every day. Down the road, I hope I can do pro-bono regardless of where I work. PC: Your work at the SeniorLAW Center and Philadelphia VIP have helped you get off on the right foot in terms of working in an area that allows you to support equal access to justice. Can you share some details with us about the kind of work you have done at each organization, and why you think it is so important? S: The mission of the SeniorLAW Center is basically to support senior citizens in the injustices that they face. The clients are elderly people, often in declining health, many living in senior housing and facing financial troubles. I help them get their financial affairs in order, whether they are struggling to pay the bills and work through estate issues, or have been a victim of identity fraud, which is more common than you'd think. I was glad to be able to use my financial background to help them. And the work that the SeniorLaw Center does is so important -- because otherwise where would these seniors be able to turn? The Philadelphia VIP organization matches volunteers with the need for pro-bono work throughout Philadelphia. So requests basically go through them and they send the work to an attorney or firm that would be a good fit. For example, in my time there I helped one of the managing attorneys get lawyers to work at a mortgage foreclosure conference at the Court of Common Pleas. This type of program has been emulated around the country, which is fantastic. There was a big initiative towards working out programs for people who are in danger of losing their homes. In this type of work, it is being an advocate and responding to the needs of people who aren't in the position to help themselves that I feel so strongly about. And I'm so glad I already had these great opportunities. Susan sets a great example for anyone looking to make a career change and follow their dreams. No matter where you're coming from, there's always a way to transition that experience into new opportunities and use continuing education to help you get there. Best of luck to Susan as she departs on her new career path!